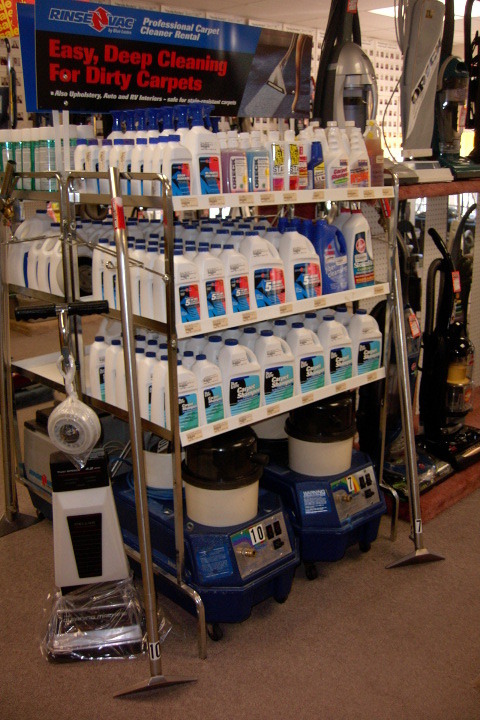 Our carpet steam cleaner rentals are easy to use, professional and deep cleaning water extraction machines. They work excellent and we keep them maintained like new. They are cleaned, tested and ready to go! Our carpet steam cleaning machines are portable, easy to operate, powerful commercial grade units for professional results. The cleaning wand will deep clean your carpet by performing 2 cleaning actions at once. A mixture of water and special cleaning solution is sprayed into the nap, separating dirt and grime from carpet fibers while powerful suction vacuums it all away. A hand tool is also provided for cleaning your furniture and stairs or even your car upholstery and carpeting. 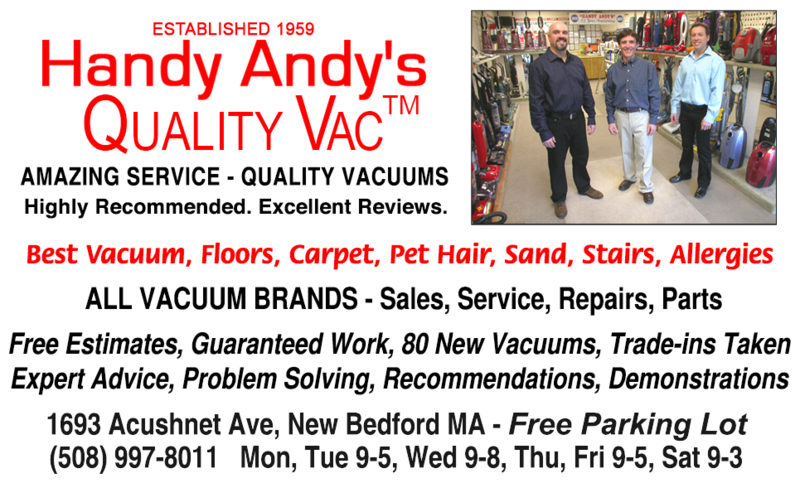 Our carpet shampooing machines are highly portable, smooth operating, double rotary brush commercial grade units. These machines perform 2 cleaning actions at once. A mixture of water and shampoo is dispensed onto the carpet while rotating brushes create suds. Shampoo suds combined with rotating brushes, gently loosens dirt and grime, separating it from carpet fibers to be vacuumed up when dry. Drying time will vary with both carpet steam cleaners and shampooers from 4 to 24 hours (about 8 hours is standard) depending on the type of carpet fiber, thickness of nap and weather conditions. Drying time can also be shortened with carpet steam cleaners by controlling the amount of cleaning fluid dispensed and recovered and with carpet shampooers by controlling the amount of shampoo dispensed. There is no need to reserve a rental machine. We have more than enough machines properly maintained, in perfect working condition, ready to go at all times. 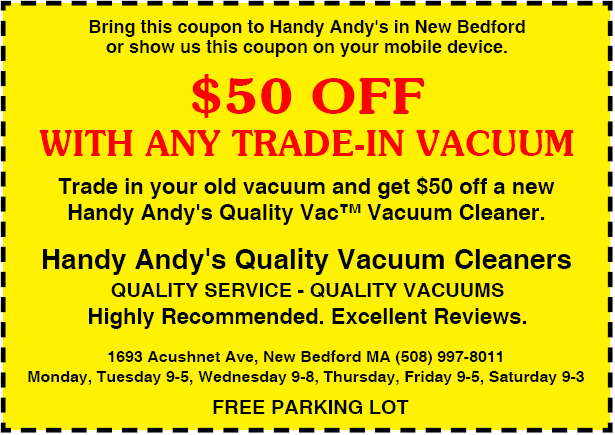 Your rental experience with Handy Andy's Quality Vacuum Cleaners will satisfy you in every way. Our staff is professional and courteous, and will be very helpful explaining setup and operation. Written instructions are also provided below. We will place the rental machine in your car and remove it when you return. You can expect our rental machines to do an excellent job. The fixed tank is for clean water and the removable tank is for dirty water. Fill the fixed tank with 3 gallons of hot water to a level three inches from the top. Add cleaning solution per instructions on the bottle. Push one end of the suction hose onto the dome cover of the removable tank and the other end onto the cleaning wand. Push the female coupling sleeve back on the machine and insert the male coupling end of the spray hose and let it spring back to lock it in place. In the same way, connect the female coupling end of the spray hose to the male coupling on the cleaning wand. Turn on the suction and pump switches. Place the cleaning wand on the carpet. Clean back and forth with overlapping strokes and squeeze the trigger to release cleaning solution only on the backward stroke. Watch the removable tank as it fills with dirty water and when it reaches three inches from the top, stop the machine and empty it. When you have finished, you can dispose of any remaining cleaning solution in the fixed tank by sucking it out with the suction hose into the removable tank. The setup instructions are the same as above. Just substitute the upholstery nozzle for the cleaning wand and hook up the hoses the same way. You can rent a machine from opening time one day until closing time the next day. That's up to 2 days use for the price of one. When you rent a machine on a Friday or Saturday, you pay for one day and don't have to return it until Monday before closing time. If there is a Monday holiday, you don't have to return it until Tuesday before closing time. That's up to 4 days of use for the price of one. Anytime you rent a machine Monday through Thursday and when there is a holiday the next day, the holiday is free. Return it on the following day before closing time. NOTICE: No rentals can be done during our annual family vacation weeks: Presidents Day Week in February, Patriots Day Week in April, Fourth of July Week, the 3rd Week of August and Thanksgiving Week in November.